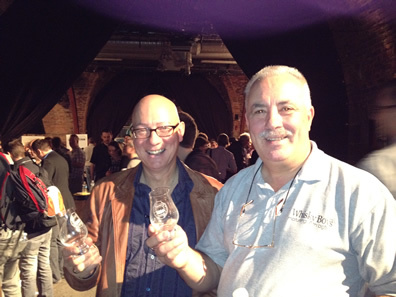 This is the second Glasgow Whisky Festival and Jim and Nicola were once again looking forward to this sold out event. We arrived early in Glasgow and once again had a good lunch in the Piccolo Mondo a fine dinning Italian restaurant not far from The Arches, after which we headed for the festival but before entering the Arches we had to pop round to McSorleys’s bar where we agreed to meet our guest for the day Gerard Burns the well known Scottish artist. The first pour of the day was at 1 pm and the final pour was at 4.45 pm which gave everyone plenty of time to enjoy a dram or three of their favourites. The Arches were holding almost 50 stands which makes it one of the biggest in Scotland and still outshines Glasgow’s Whisky Live’. The Whisky Boys and their guest Gerard had a fabulous time chatting with the stand holders and enjoyed some wonderful drams. We met many friends as we walked around the Arches and they included Alex Robertson, Chivas Brothers International brand Ambassador. Donald Colville, Diageo’s Classic Malts Ambassador. Kerry Johnstone, Scottish Field Executive. Helen Stewart, U.K. Brand Ambassador for The Scotch Malt Whisky Society, and many friends from the Glasgow Whisky Club and the Helensburgh Whisky Group. The only down side we found was that to increase the number of visitors to 900 was maybe a tad too many, last year there was only 600 and albeit there were less arches opened we did find that 900 made it too busy and a little claustrophobic. Our guest, Gerard enjoyed this his first Whisky festival and said he would no doubt love to visit other festivals and maybe do a couple of distilleries, the Whisky Boys are now working on a wee mini tour for Gerard. To finish we must give a big thanks to Mark Connelly and Bill Mackintosh for another great festival and to all the stand holders for their fantastic drams and there overwhelming patience with many of the tasters.